Like humans, some cats suffer allergic reactions to certain foods, among which are grains, such as wheat, rice and corn. Maybe your pet has been diagnosed as having such a condition, or perhaps you are interested in controlling your cat’s diet so that it more naturally resembles what he or she would eat in the wild. For many devoted pet owners, the ability to identify good quality alternatives to the traditional ranges of cat foods can be made more difficult by the huge choice offered by manufacturers. 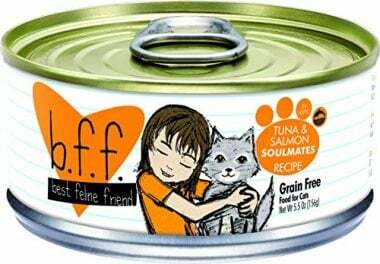 Here to help, then, is our top selection of grain free cat foods on the market. This grain-free formula is enhanced with sweet potatoes and peas to offer your cat easily digestible sources of protein and assist in the development of strong and lean musculature. Other vegetables and fruits such as tomatoes, blueberries and raspberries provide antioxidants to help promote overall wellbeing, including a healthy coat, skin and immune system overall. Probiotics including those from dried chicory root helps aid good digestion. With no grain, corn or soy, there are also no artificial preservatives, flavors or colors. 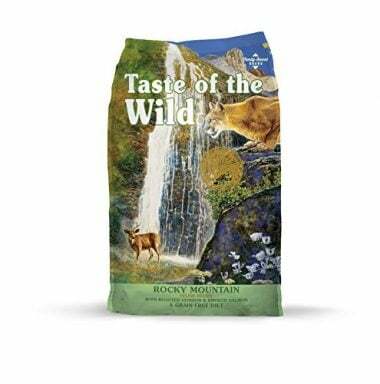 The product contains real smoked salmon and roasted venison to tempt the taste buds and has been formulated for optimum nutrition for felines of all ages, from kittens to senior cats. 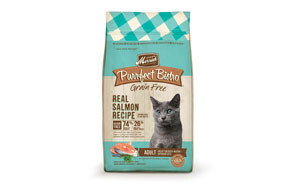 This dry cat food is grain and gluten free, and complex carbohydrates to meet your pet’s needs come from sweet potatoes rather than wheat, rice or corn. 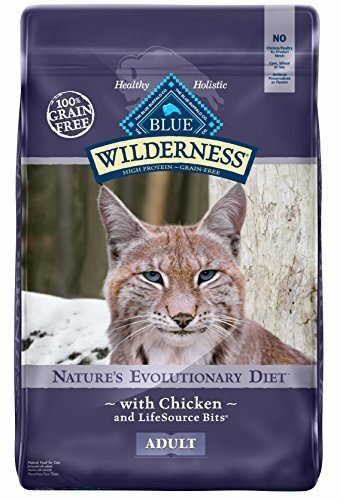 The recipe contains high quality protein from deboned chicken, rather than chicken or other poultry by-product meals, more naturally recreating the diet your cat would eat in the wild. However, unlike a raw diet, this is far easier for owners to prepare and use; and also contains the additional supplements you’d expect to make sure your cat’s diet is nutritionally complete. These supplements combine the vitamins, minerals and antioxidants recommended by animal nutritionists and vets to support a strong immune system, healthy skin and coat, and robust muscle development; while all aiding optimal digestion. The balance of calories from fat and proteins will assist your cat to maintain a healthy weight. No artificial preservatives or flavors are used in the manufacture of this product. 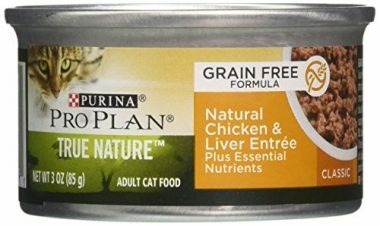 For pet owners who prefer to feed their cats a wet diet, there is Purina Pro Plan True Nature Natural Grain Free formula. Grain and gluten free, with no added artificial flavorings, colorings or preservatives, this recipe contain levels of high quality protein derived from real chicken and liver as the top ingredients, helping to promote optimal body condition. Added essential nutrients, including 25 essential vitamins and minerals, make this a complete food for cats – no need to include any supplements in their diet. 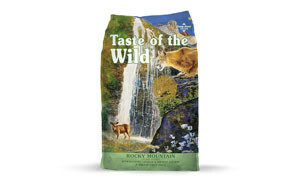 The product has been formulated by Purina’s panel of over 400 nutritionists and vets and is manufactured in the US. Online reviews from pet owners suggest this is a great choice for diabetic and overweight cats. With Whitefish as the top listed ingredient and egg added to the recipe, this grain and gluten free food is rich in high quality protein, and contains no soy, wheat or corn nor poultry by-product meal. There are no added artificial colors, flavors or preservatives either. With essential nutrients including vitamins and minerals added to the formula, this is a complete and balanced food for cats – no other supplements need to be fed to keep your cat healthy. However, as with all dry foods, pet owners should ensure a fresh source of drinking water is always available. The product is developed in conjunction with nutritionists and vets and manufactured in the US, with the makers stating that no ingredients are sourced from China. 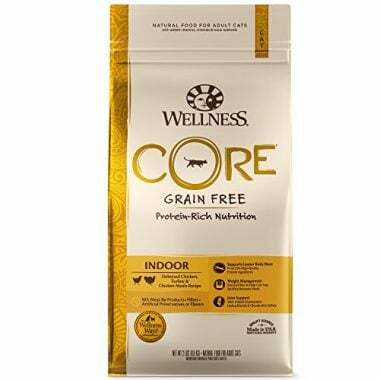 Wellness describes their cat foods as designed to closely mimic the diet of a cat in the wild, containing animal proteins from high-quality sources in high concentration within the formula. This complete cat food also incorporates dried kelp to offer beneficial fiber, which together with the protein-rich recipe will help you cat feel fuller for longer without overeating, thereby assisting in the maintenance of a healthy body weight. The inclusion of cranberries, which promote a healthy urinary tract by preventing the growth of harmful bacteria, make this formula beneficial for indoor cats. Glucosamine Hydrochloride and Chondroitin Sulfate assist with healthy joints. All ingredients come from natural sources and there are no artificial colors, preservatives or flavors. The product is manufactured in the USA. If you’re not only concerned with the welfare of your cat, but the welfare of the planet in general, Weruva’s formulas seem to tick all the boxes. It is dolphin and sea turtle-safe, free from grains, gluten, starch, potato and MSG; and also GMO free. Additionally, it is produced in facilities and with ingredients also used for humans, and all protein content is derived from ethical, sustainable sources. 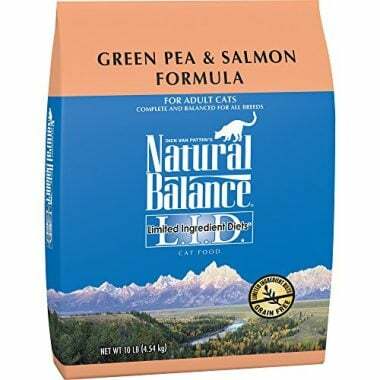 Best Feline Friend offers a complete and balanced diet made from all natural ingredients; it is low in carbs and fat, but rich in proteins from high quality sources. The high moisture content ensures your cat gets the fluids it needs. Weruva also offers variety packs containing a range of flavors in both aspic and gravy, so even the most finicky of cats won’t get bored with the selection. This holistic formula has been developed especially for indoor cats, to meet all their nutritional needs while preserving and maintaining an ideal body weight. Protein comes from high quality Whitefish and the calorie count is carefully balanced. With no corn, wheat or soy filler, nor any chicken or other poultry by-product meals, the food also does not contain any artificial colors, flavors or preservatives. Essential nutrients are added to ensure optimum health over a range of areas, from joints to strong muscles and healthy eyesight. These vitamins, minerals and antioxidants are blended into BLUE’s proprietary formula that they call LifeSource Bits, and are processed at low temperatures to ensure the goodness is retained so there is no degradation during manufacture. Merrick offers farm fresh ingredients in this formula which are combined in a ratio of 74% protein and fat ingredients to 26% carbohydrates, fiber, vitamins and minerals. This offers the right balance of high protein and moisture levels; measured fat levels; and low carbohydrates to meet your pet’s needs without becoming overweight. 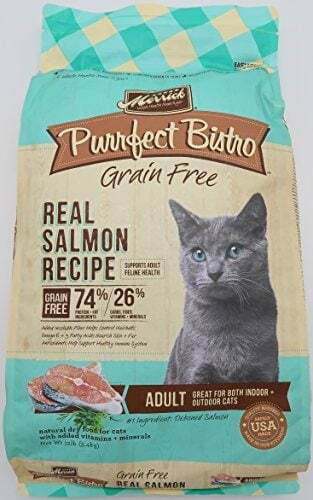 The top ingredient in all Merrick’s Purrfect Bistro range is a high quality protein source; in this case, deboned salmon. The recipe offers a 100% complete and balanced diet for adult cats with no special nutritional needs. Essential fatty acids – Omegas 3 and 6 - are included for healthy coat and skin. Merrick does not use ingredients from China and no corn, wheat, soy or gluten are included in this product. Natural Balance limits the number of protein and carbohydrate sources in its recipes so that pet owners can identify and balance exactly what goes into their cats’ diets. This particularly assists with cats who suffer from food allergies and intolerances. The protein is derived from high quality sources, such as salmon in this case, designed to ensure a sleek, shiny coat and optimum muscle tone. Carbohydrate needs are met by green peas rather than wheat, soy or corn, for owners who prefer their cats to have a grain free diet. Omega-3 and Omega-6 fatty acids assist in maintaining a healthy skin and coat. The recipe is complete and balanced according to regulatory standards. There is also a version specifically designed for indoor cats. 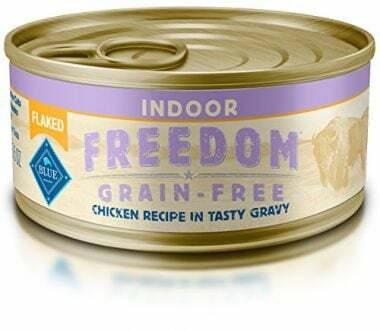 Formulated for cats who do not thrive on grain-based diets, this grain and gluten free recipe is also specifically designed for indoor cats. Features incorporate the inclusion of cranberries to maintain health in the urinary tract and a proprietary blend of natural dietary fibers which assist in easing hairballs through the digestive system to prevent issues with these. Because cats who live indoors are also prone to excess weight, the ratio of calories to fat is carefully calculated to avoid obesity. 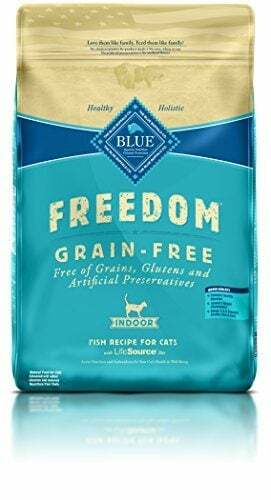 BLUE Freedom contains no wheat, corn, or soy, nor any chicken or other poultry by-product meals. There are no artificial colors, preservatives or flavorings. If you want to switch your cat to a grain-free diet, where do you start with all this information? The obvious source of advice is your vet, who will be pleased to make recommendations based on their knowledge of feline nutrition in general and the health of your cat specifically. Look for evidence that the food you are considering is ‘complete and balanced’, which means it complies with the nutritional guidelines laid down for pets by the Association of American Feed Control Officials (AAFCO). Also check that the food is appropriate for the particular life stage your cat is at: kittens have greater nutritional needs to support healthy growth and development than adult cats, for instance. Another important factor is your own cat’s preference – for wet over dry food, for instance; for flavors and so on. And finally, when changing any pet’s diet, make the switch gradually, increasing quantities of the new food while decreasing the old, in accordance with the manufacturer’s instructions. This ensures your pet’s body will adapt gradually to the new diet without any adverse side effects. The answers to the following questions may also help inform your choice. 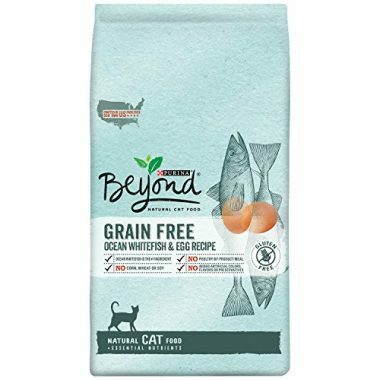 Does My Cat Need a Grain Free Diet? If you suspect your cat has allergies, your veterinary can carry out elimination tests to establish what (if anything) in her diet is causing the distress. Some owners also believe their cats have an intolerance (rather than an allergy) to grains, and experience fewer episodes of vomiting when on a grain-free diet. Cat foods often use grains as ‘filler’, additional ingredients to bulk up the carbohydrate count. Wheat, corn and rice are all relatively cheap, so often, in grain-free varieties, this is replaced with higher quality ingredients. Your cat would certainly not be eating grains in the wild out of choice! 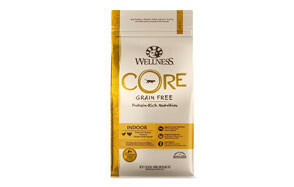 Grain-free foods therefore more closely resembles a ‘natural’ diet for your pet. There’s no doubt that some cats suffer from food allergies and intolerances, just as humans do. If your cat has been diagnosed by a vet as suffering from an allergy or intolerance to grains, then a grain free diet is a no-brainer as it eliminates the ingredients that can cause a bad reaction. Remove the grain from cat food and that has to be replaced it with something. Grain-free foods often end up being higher in fat, so it’s important to watch the fat content and ensure your cat has a balanced diet. 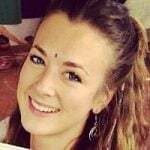 Otherwise, she is liable to become overweight, which is never healthy. Grain-free cat foods tend to be more expensive. However, because your cat will be able to meet all her nutritional requirements from a smaller portion, you may well find you are feeding her less and the cost balances out. What Makes a Good Grain Free Cat Food? Your cat needs a high quality food that meets all its nutritional needs in order to remain healthy. One of the best tests is to ensure the grain-free food you will be feeding your cat meets the nutritional standards laid down in guidelines by the Association of American Feed Control Officials (AAFCO). Pet food companies must adhere to these before advertising their products as ‘complete and balanced’. Remember, though, that every cat is an individual and will have their own specific requirements. There’s also the ‘taste test’: even if you buy the finest, most highly recommended cat food on the market and she won’t eat it, then you’ve wasted your money! Luckily, there is a good selection of flavors and types on the market these days, so take your vet’s advice on what your pet’s nutritional needs are and then try different recommended, high quality types that meets AAFCO guidelines till you find one she likes. Although cats do not have the same enzyme in their saliva that we have – called salivary amylase – which assists in the breakdown of grains before they reach the stomach, they do have amylase secreted by the pancreas. This allows them to break down grains in the intestines as digestion occurs. So it is entirely possible for them to absorb carbohydrates from grains, although their diet in the wild would typically only contain small amounts.